I tried to fill the whole screen up as much as I could, without making it a big mess, so I put something from the bottom to the top literally. Let's start from the bottom. 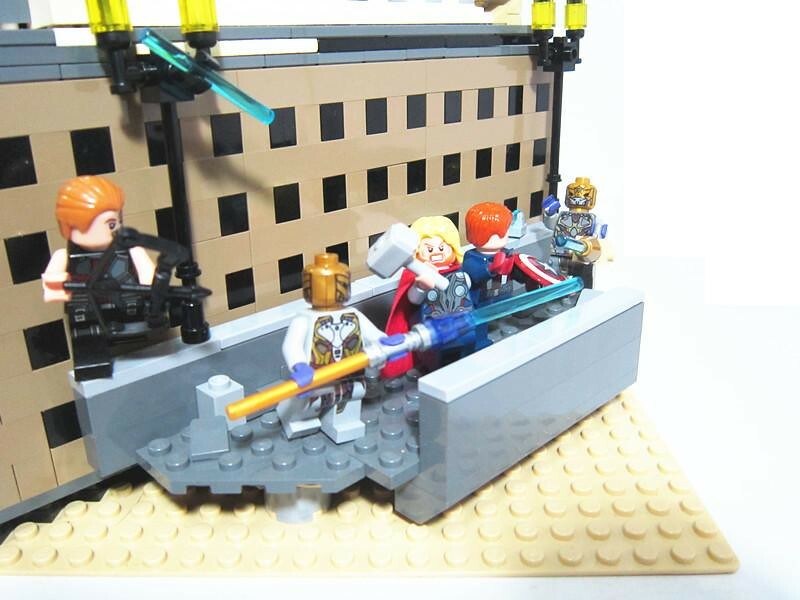 I picked the scene from the very end of the final battle, where Cap and Thor are fighting side by side with the Chitauri Soldiers. 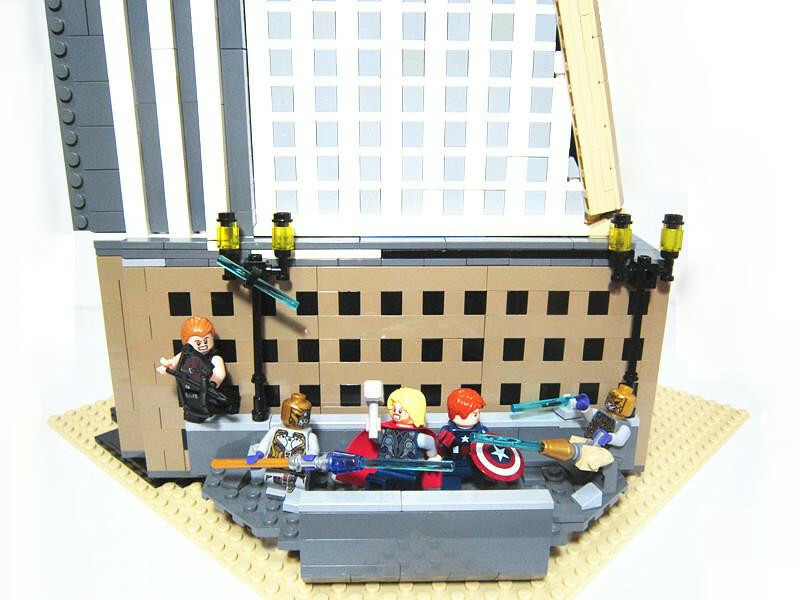 Yeah, I put Hawkeye there as well, which has probably reduced a bit of accuracy here, but I thought it will be weird not to include the full team, while Hawkeye was supposed to be somewhere in/on another building far away and out of the scene. 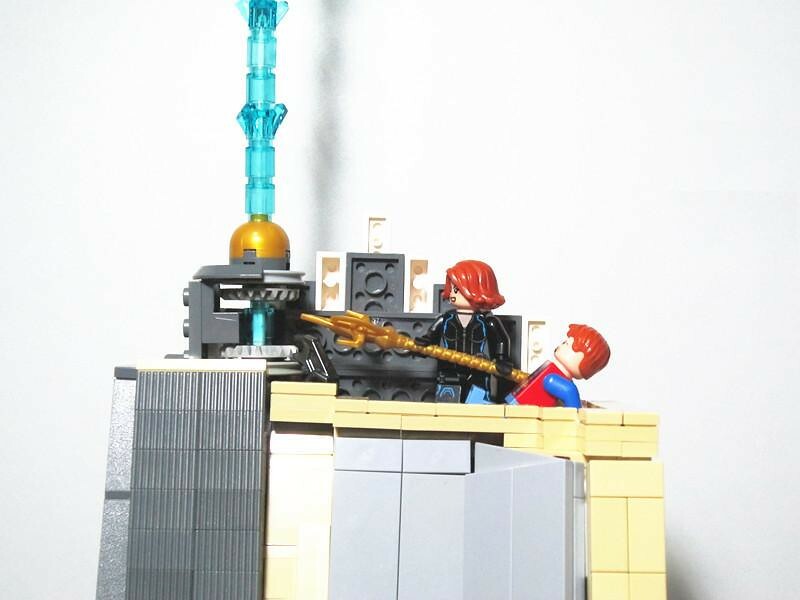 Trying to be original, I built those spear-like weapon in a really simple manner for one of the Chitauri Soldiers, not a big deal, but I am quite happy with that little touch. 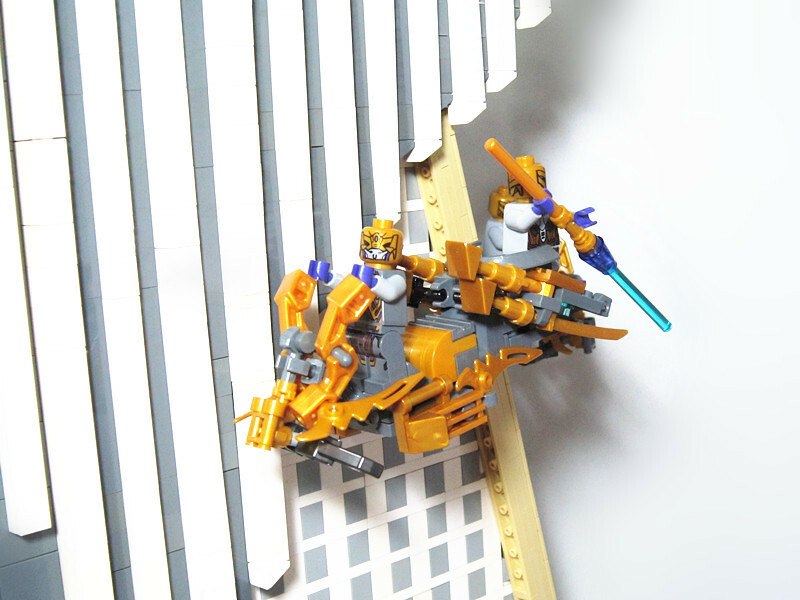 For the middle part of the tower, I have built two different Chitauri Chariots, one 2-seat and one 1-seat, which are one of my favourite parts of this MOC. I built them in the very last stage of the project, but they turned out quite pleasing. To be honest, I can't stop playing and flying these little vehicles around my flat! 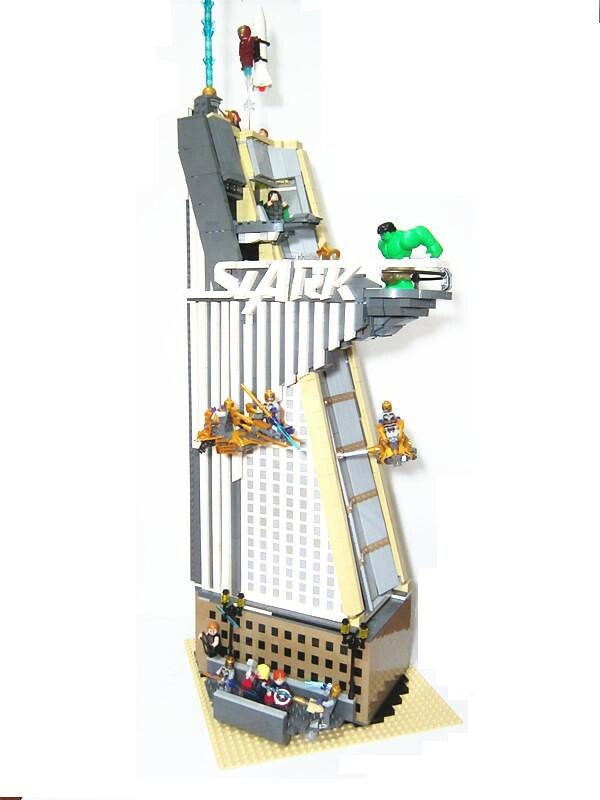 The last part is the top of Stark Tower, which is the main focus of the whole build, and most of the actions happen right here. I have selected 3 iconic scenes from the final battle to be included here. The first one is the PRE-puny-god scene. 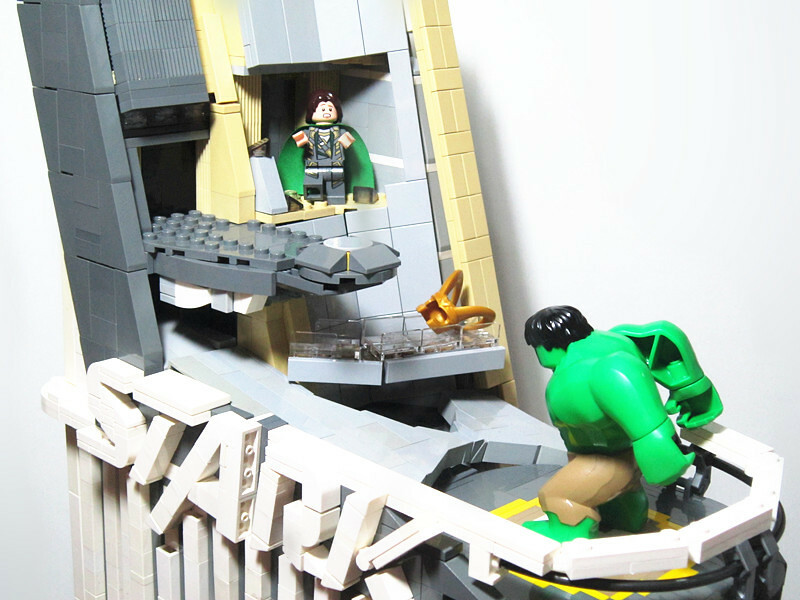 Well, I did plan on having the Hulk smashes puny god scene in the beginning, but due to the limited scale, turned out it's impossible to fit the man with anger management issue in such a small room. Then, I chose the scene where Black Widow is ready to close the portal, while Dr. Erik is panicking at the back. (Sorry for not having a grey hair piece for Erik.) 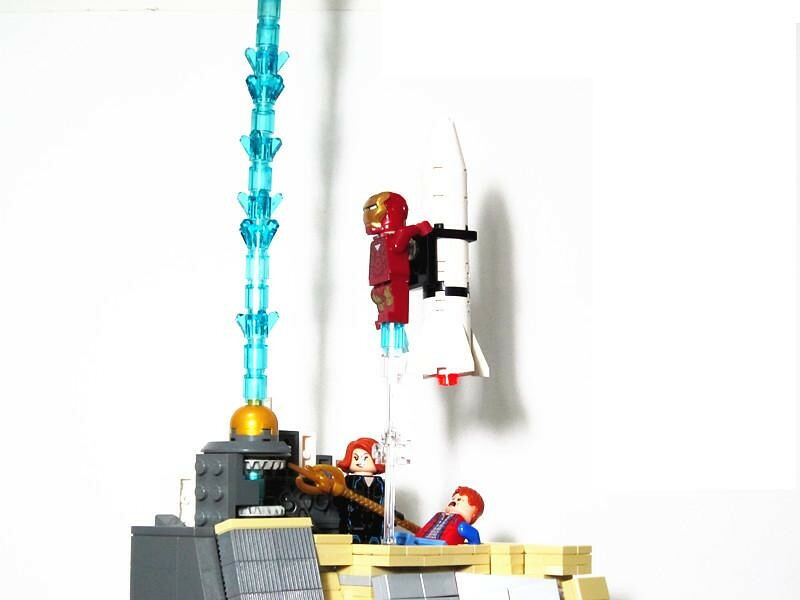 And finally, the part where Tony decided to sacrifice himself and take the nuclear with him all the way up, even though he knew it's a one-way trip. Apart from the scene, there were a few challenges I have faced through the build, or stuffs that I really wish you can see my effort. First, it's the STARK logo. 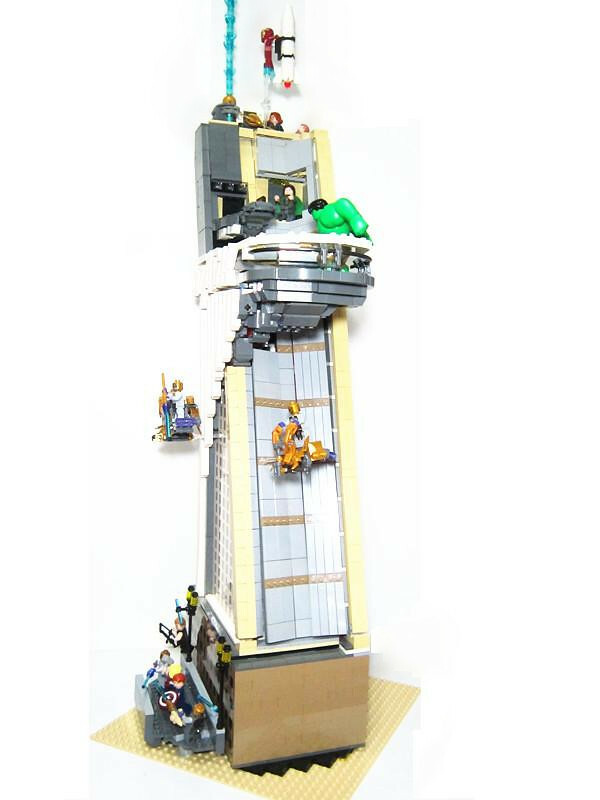 I have browsed through the web to look for previous Stark Tower done by other LEGO fans around the world, and first of all, all of them are incredible, but somehow I felt like no one was paying the attention that the logo deserved. It's like the most iconic part of the tower, and it's the greatest fun to work with font. I am very very happy with the outcome myself, no sure what do you guys think. The other major difficulty I faced, was the large outer platform with the "S" in the middle. 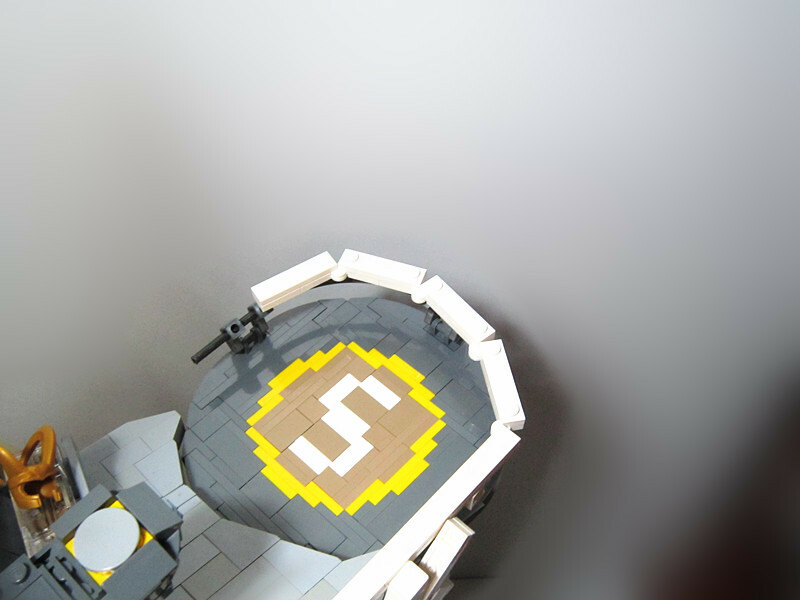 Took me days to find a way to make a perfect circle(almost ;) ), build an "S", and build smaller yellow circle around the "S" at the same time. Another great challenge is the weird curve "windows" on one side of the building. I didn't go with the way most people do, with trans bricks, coz I don't have those...BUT the real deal is all the angles and Maths. 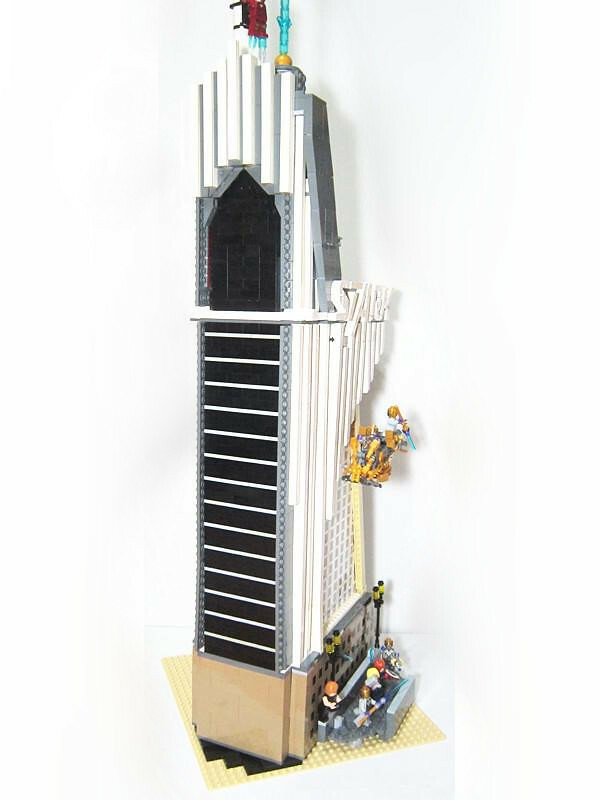 Try to build one yourself and you will find it really tough because bricks are not like paper, you can't really curve them up while placing them at an angle but still want them to have a smooth clear cut "straight" horizontal edge at both ends. I'd say it would have been better if I have enough 2x4 tiles to fill the whole lower half of that pile of windows. 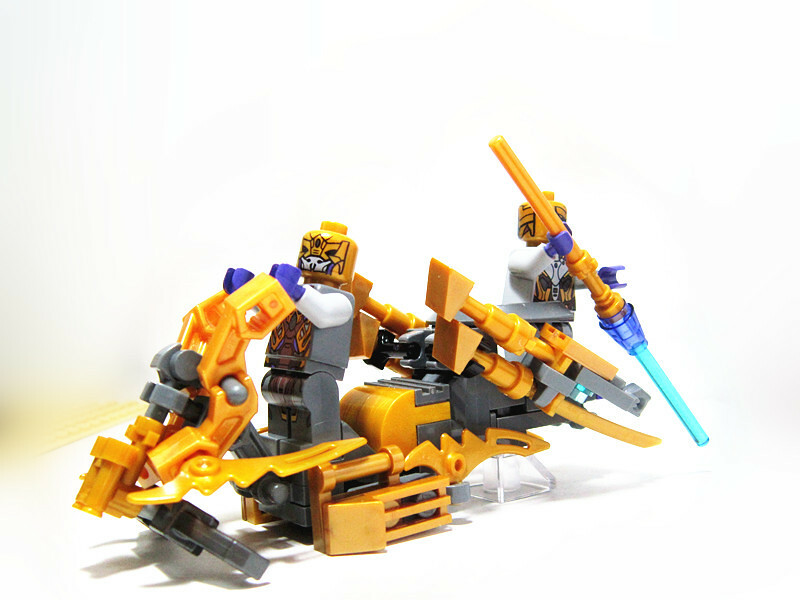 I really hope you guys enjoyed reading this long boring introduction of my biggest MOC ever, and I really wish experts and master builders here can give me some constructive comments to improve myself, as there is always room for improvement, especially for a youngster like me :P.
Incredible! I love how the Stark logo turned out. 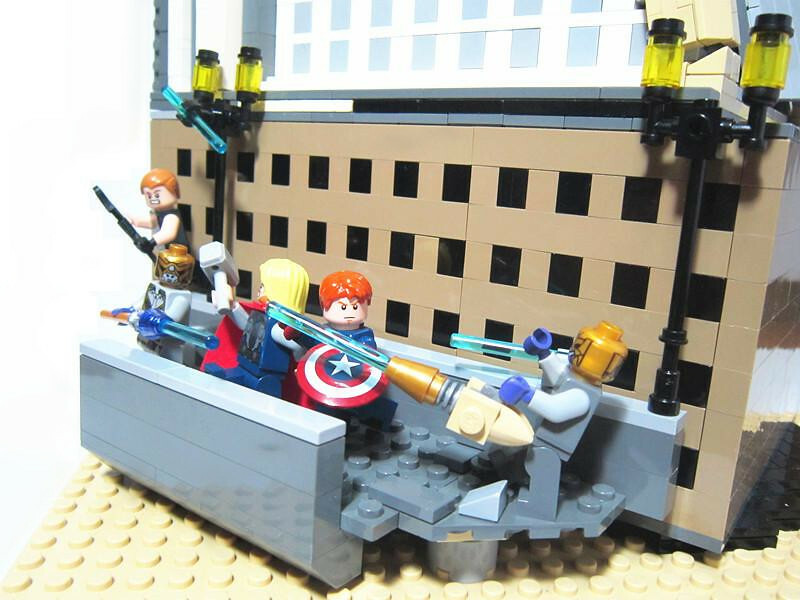 The Chitauri vehicles are awesome, much better than the officials. It must have been tricky to master all the angles on the tower! My only gripe would be I don't really like all the exposed tan around the base of the tower. It might help to cover them up with light bluish grey times or something. 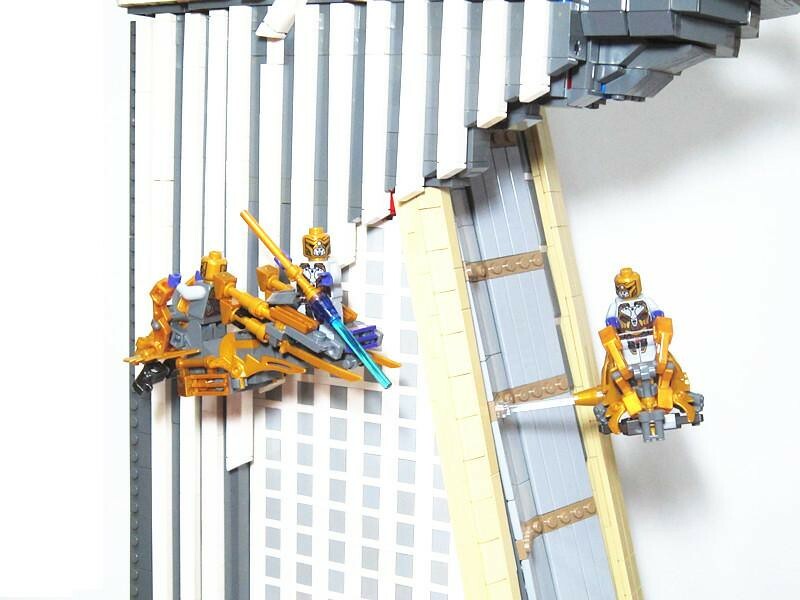 Anyways, great MOC and I can't wait to see what else you build! First of all, I must congratulate you on this job well done. I really find the Chariots well done and very accurate. The forced perspective style build on the street is awesome and so is the tower itself. 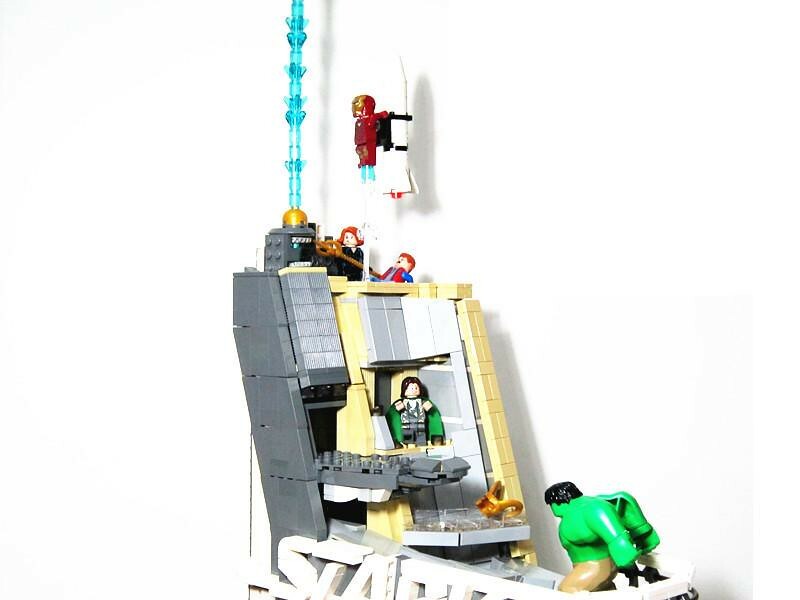 The "STARK" lettering at the top is pure genius and none of the colors clash on the overall build. Amazing! 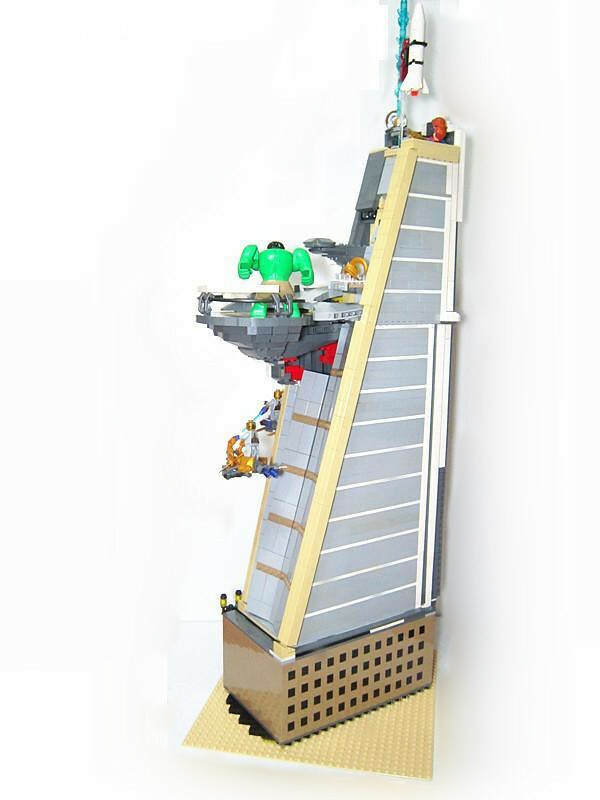 Truly a spectacle of Lego creation and I would go as far as to say this is borderline Lego art. If I were you I would proudly display this in a gathering room such as the kitchen or living room for everyone to admire. Great job man and since your first mission was to impress us, I'd say you truly did. 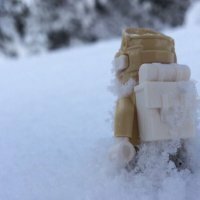 An awesome build ! 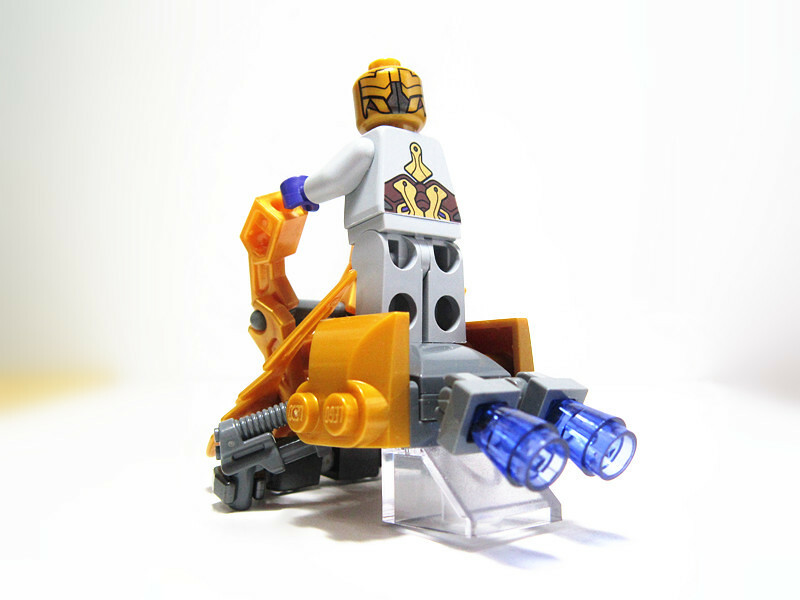 The chariots are great! The attention to detail here is incredible! 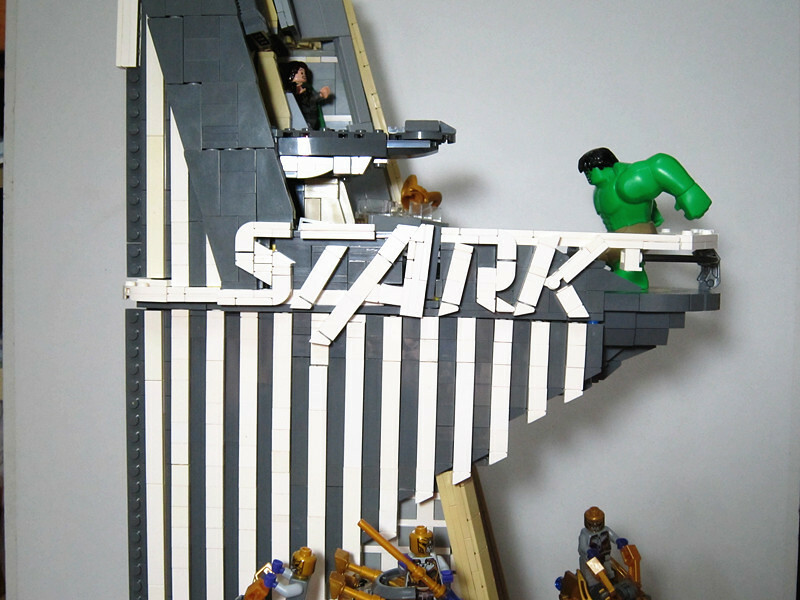 I love the STARK lettering and the Chitauri Chariots! I rarely comment but I had to log in to say a few words.. I love the STARK logo. It looks perfect. The overall shape and details are fantastic-- amazing job. 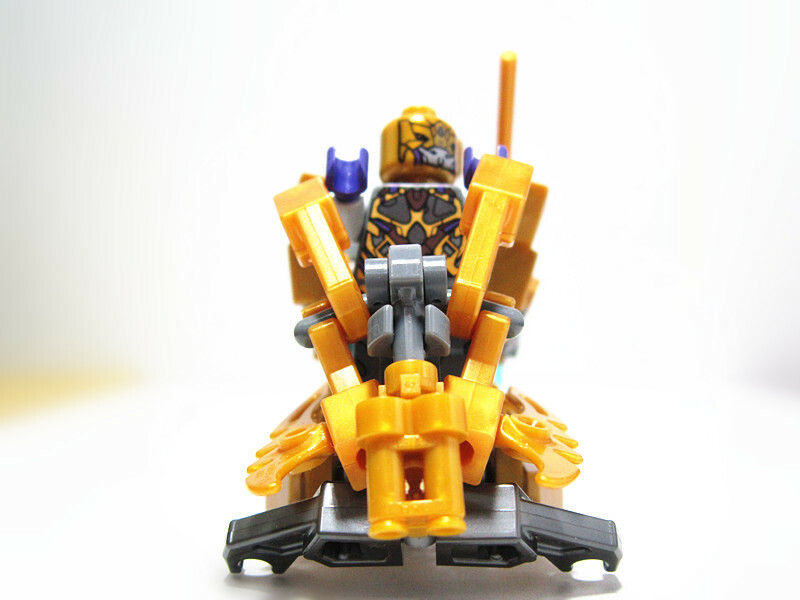 Very nice detailing! Keep it up! This is beautiful! Gorgeous detailing on the chariots and the "Stark" lettering is just perfect. I also love the work on that terrace.